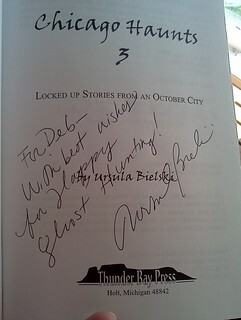 I finished my autographed copy of Chicago Haunts 3 on Friday night. If you've read the previous two books, Chicago Haunts and More Chicago Haunts, this is more of the same although the author goes southeast almost to the Indiana border and west as far as Cherry Valley. If you haven't read the first two and you don't know anything about hauntings in Chicago, this book will have references that you won't get. As is the nature of a serial, the author refers back to previous stories. In some cases, she provides a bit of a history. More often, she just mentions that you'll find the story elsewhere. This isn't a negative of the book, just a note that if you pick this up as your first exposure to ghosts of Chicago, you're going to come away disappointed because that's not what she's doing in this book. Beilski has an immensely readable style. It's breezy and devoid of over-the-top moments. She reports the stories with an eye toward, this is what happened or is rumored to have happened. In her introduction, she mentions that some stories she collected left her shaken and you are warned. Being yet one more layer removed from the actual events, I wasn't scared by anything related in the book. There are some places she talks about that I don't think I would go alone, particularly at night, because the mind plays tricks on you and you can think you see something you don't. Orbs are a classic case of this. At night, a camera flash will illuminate dust particles in the air that we cannot see. People will jump on this as evidence of orbs, something associated with hauntings. Um...no. It's just evidence of dust in the air. Cemetery "lights" are another thing. I used to think the Monona City Cemetery was haunted. Every time we passed it at night, I would see these flashes of light in the cemetery. It was only when I started reading about the paranormal that it was explained to me. Flashes of light in a cemetery are, more often than not, reflections of car headlights. Highly polished marble tombstones are the culprit here, not ghosts, yet your mind could tell you there is something strange going on because you want to experience it. Now, I'm not a skeptic. I believe there are things we don't understand. There are enough ghost photos and stories of hauntings with no logical explanation that I believe there is something to this. Things happen that we just can't explain. Something falls off the shelf and there were no ground vibrations nearby which would cause it to happen. A photo shows an image of a person where everyone swears no one was. One of my guild mates felt someone stroke her hair while she was working alone during the day in an office in a building that was supposed to be haunted. I don't think I've had anything ever happen to me until Saturday. Now, I don't know. One of these daily is part of the number of drugs and vitamins I take for my RA. They are large, about an inch long. I bought this bottle when it was on sale, buy one get one free, and I happened to be picking up the monthly drugs. It's a great deal. This is a 4 month supply so I have 8 months of vitamins with the two bottles. On Friday, I finished the last pill in the bottle. I couldn't swear, at the time, but I thought I had only finished bottle #1 of the two, so I went to the bathroom to get the next bottle. I couldn't find it. These are rather large bottles so it's not going to fit just anywhere. I went through both drawers and under the sink. Nothing. I checked the shelves to the left of the medicine chest. (It's too big to fit in there.) Nothing. I opened the bin I have on the floor in the bathroom. It has sunscreen and Ace bandages but no vitamins. I looked around the microwave since I keep my drugs on top of the microwave so I remember to take them in the morning. Nothing. I even looked under the kitchen sink, although I didn't know why I would have put it down there. It wasn't there either. I picked up the old bottle and tossed it into the recycling container. Oh well. Maybe my mind is playing tricks on me. I may think I was on bottle #1 but, in reality, I'll bet I was on bottle #2. I went to the office and, over lunch, started a grocery list for the weekend, although I wasn't really planning on leaving the house. Item number 1 was "calcium + D 1000". Saturday morning, I got up and lurched into the kitchen. Did I want to make waffles this morning? Nah. I'd go with peanut butter toast and yogurt. That will be good. I came to a screeching halt as I walked into the room. There, on the counter in front of the microwave, was the bottle. I blinked for a moment and looked at the back door. I could have sworn I pitched the old bottle into the recycling. Maybe I hadn't. Oh well. I'll just move it to the left side of the sink and pitch it later. I picked up the bottle and nearly dropped it. It was full. Not only that, the lid was unscrewed and the paper seal had been started as if someone had left it for me so it wouldn't be hard to open in the morning when my RA is most acute. I set the bottle back down, backed away from the counter and just looked at it. This was not here when I went to bed Friday night. I will swear, on a stack of bibles two miles tall. It was raining when I got up and I wasn't looking forward to having to go to the grocery in the rain. Now, it was clear I didn't have to go, but where did this come from? To the best of my knowledge, I did not have an unexplained black out Friday night. I can, mentally, account for my time from when I came home from work to going to bed. I'm not aware that I sleep walk. I would think I would have discovered other things awry which would cause me to wonder about somnambulism. I dumped out all the pills and spent an hour looking over all of them. They look fine. My doors were locked so no one came into the house overnight. That would be creepier still; the thought that someone came into my house and gave me a bottle of the vitamins I'm supposed to take, particularly when I didn't tell anyone I was out of them. So, dear readers, I got nothing here. If there was something awry with my house, I would think the girls would be restless as it's well known that animals can see and hear things we can't. It is entirely possible I found this in my sleep, opened it, and left it out for me to find the next morning. I just don't know. I went on with my life but I have to tell you, every time I used the microwave this weekend and then, when I dumped out the morning's pill, I just had to wonder. Perhaps I should stand in my kitchen tonight and audibly thank the ether for finding it. Saved me money.